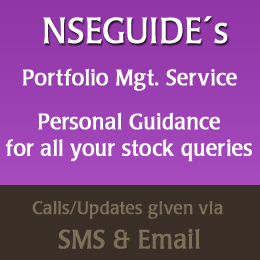 NSEGuide now launches portfolio management services, which shall include Intraday, Short term, swing calls and long term investments along with mutual funds (if interested). You will personally receive calls and be given advice (entry/ hold/ exit levels). Intraday/Short Term shall mainly be based on Technical breakouts and would be more focused on fundamentals for long term stocks. You can review our performance for the same here. Along with the calls given on the site, additional calls shall be provided along with guidance for your current holdings. We are providing 6 different options suiting to your training styles. Options only – Rs.3,500 monthly. Futures only – Rs.6000 monthly. At any point of time only 1-2 call will remain active. All calls shall be given by CB and Kartik, updates shall be sent via Call or SMS or Email. You can fill in the below form to avail subscription.